Just a quick reference over to Minimalist Mama’s home site for a round-up of the best San Francisco toy stores. If you like to do your toy shopping in person and you live near West Portal (or are looking to buy for a number of upcoming occasions and it’s worth it to make the schlep), definitely, definitely, definitely hit Ambassador Toys’ West Portal location (186 West Portal Ave.) You’ll find something for every kid on your list, no matter what your budget or the kiddie’s preference. Really. 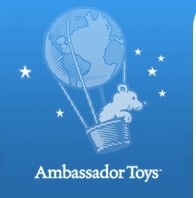 It’s like the mother ship of fantastic, quality, original toys.